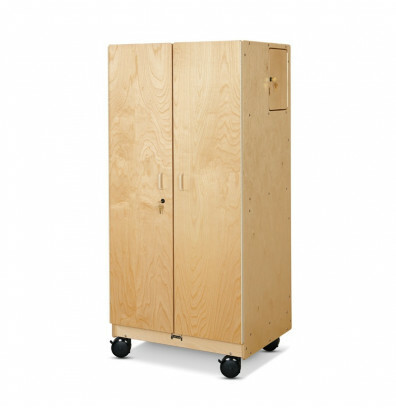 Jonti-Craft hideaway mobile classroom storage offers durable plywood construction. Features a separate storage space on the side for valuables and personal items. Rolls smoothly on casters. 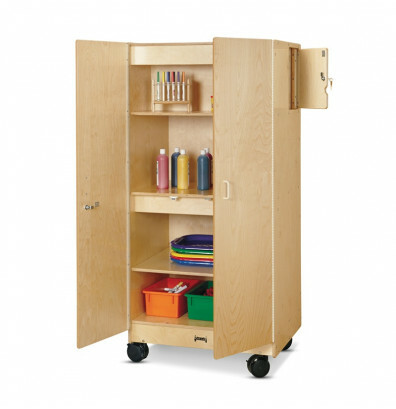 Jonti-Craft 5946JC hideaway mobile classroom storage provides storage for a variety of items. Durable Baltic Birch plywood construction with an ultraviolet (UV) acrylic coating that resists yellowing. Four full-width storage spaces includes an adjustable shelf. A separate storage space on the side for valuables and personal items. Both storage areas are lockable for added security. Ships fully assembled. Jonti-Craft 5946JC hideaway classroom storage features rounded edges that promote safety. Designed with full-length piano hinges to prevent small fingers from being pinched when doors open or close. Well suited for elementary school environments.